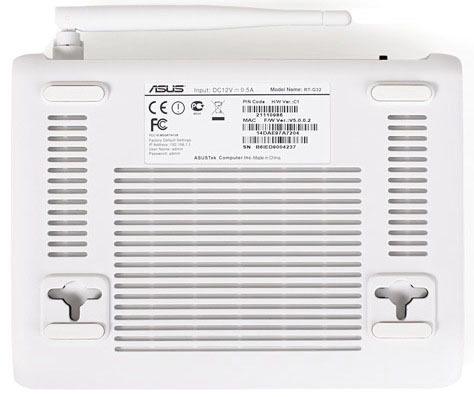 Today we’re presenting to you a review of two wireless routers ASUS RT-N10 rev.B1 and ASUS RT-G32 C1 which are in many ways similar to RT-N10U but are still different from it. 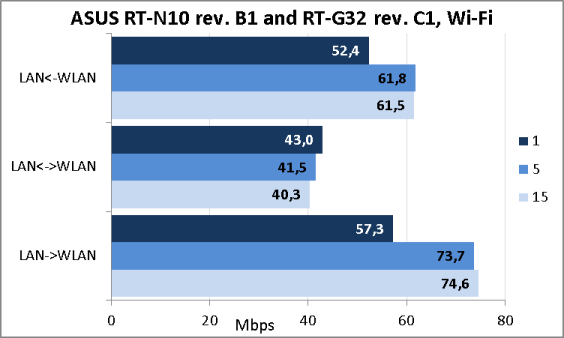 ASUS RT-N10 B1 and ASUS RT-G32 C1 are low-cost devices supporting several wireless networks simultaneously with similar technical parameters; thus we decided to review them together. 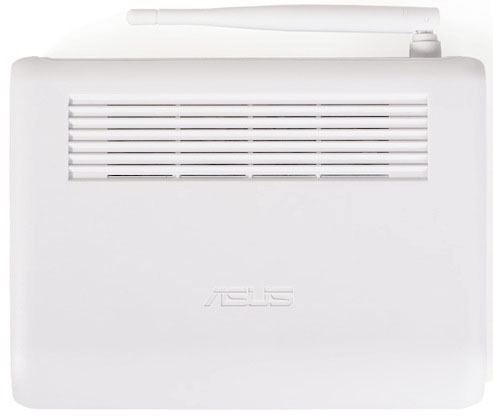 The RT-N10 rev.B1 wireless router is performed in a black plastic case whereas RT-G32 rev.C1 is in a white one; other design features are the same. The ASUS Company also produces a C1 revision of RT-N10 the only difference of which is its case, but as we didn’t have it at hand we’re not going to scrutinize it in our review. The dimensions are 173x130x26 mm not including the antenna. The upper surface has got a ventilation grate and an embossed vendor’s name. On the bottom of the devices there’re four rubber stands that allow comfortably placing the wireless router on a table. Besides, here there’re two T-shaped technological holes for mounting the device on the wall. 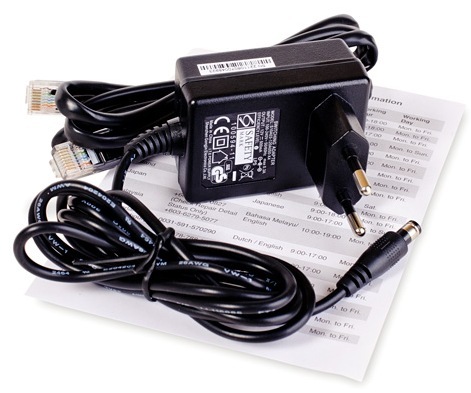 The information sticker will inform you about the required power adaptor parameters (12 V and 0.5 A), the device model, its MAC-address, PIN-code, serial number, the default IP-address and so on. Ventilation grates occupy most part of the bottom. The side walls also have ventilation holes and a decorative grey strip going along the router front surface that holds information about the vendor and the model as well as the following LEDs: Power, WLAN, WPS, WAN, LAN1-4. The purpose of these indicators is standard, however, it has to be mentioned that if the WPS LED is flashing, it informs the user that the same-name process (Wi-Fi Protected Setup) is running, which allows the user to connect wireless clients in a semi-automatic mode. On the rear wall there’re Fast Ethernet network ports (WAN, LAN1, LAN2, LAN3 and LAN4), the WPS and Reset buttons and a power slot. The undetachable antenna is also attached here. 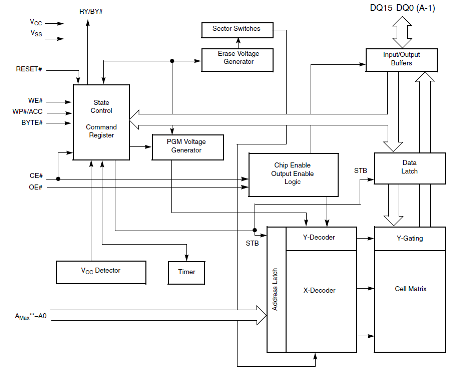 A SoC-chip Ralink RT3050F performs the functions of a CPU. RAM is represented by a 32 Mbytes EtronTech EM63A165TS-6G module working at 166 MHz. The RAM block-scheme is presented below. A 4 Mbytes Spansion S29GL032N chip was used as flash-memory; its block-scheme is also presented to our readers. Two Mnova MT0455 and one Mnova MT0454 transformers are responsible for the physical level of the router wired part. 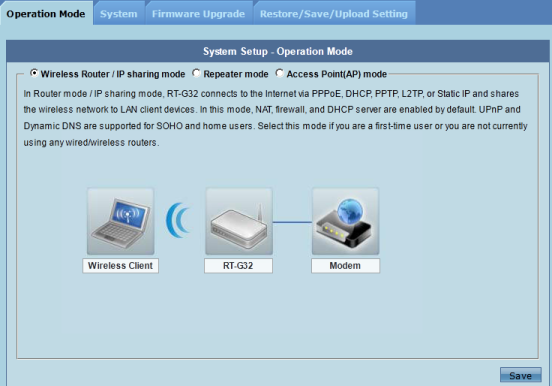 Here the study of the hardware part is over and now let’s look at the routers’ software features. One can change a firmware version with the help of the “Firmware Upgrade” tab of the “Administration” menu in the device web-interface. The whole upgrade process takes about three minutes. 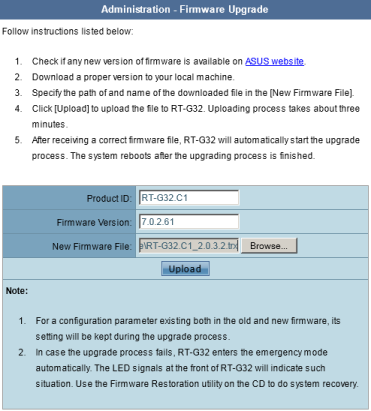 If a problem occurs during firmware upgrade, one has to turn to the firmware restoration procedure. A slowly flashing WPS LED after turning the device on is a sign that something is wrong with the firmware. For recovery one can use the Firmware Restoration utility. It’s also worth noting that it’s possible to drive ASUS RT-N10 rev. B1 and RT-G32 rev. C1 into the restoration mode manually by holding Reset pressed when the device is booting. 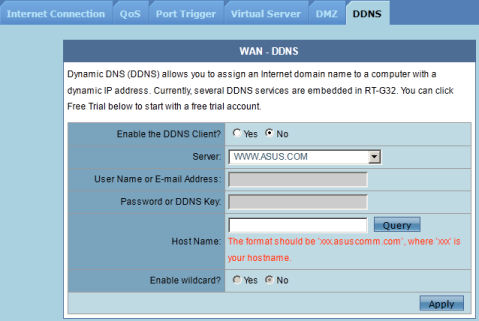 If there’s a problem with detecting a normally functioning ASUS wireless router in the network, the vendor advises to use the Device Discovery utility which detects a device and gives the administrator brief information about the product. Unfortunately, we weren’t able to find a utility set for RT-G32 rev.C1 on the vendor’s site. 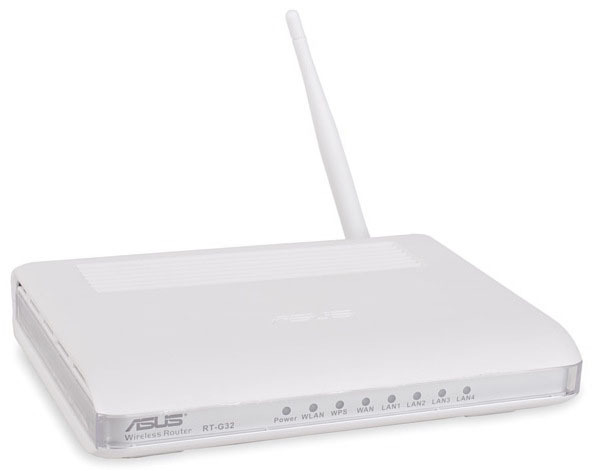 Luckily, the user can take advantage of the utilities intended for other ASUS wireless devices. Here we’re through with the review of the firmware recovery procedure and are moving on to studying the features of the devices web-interfaces. 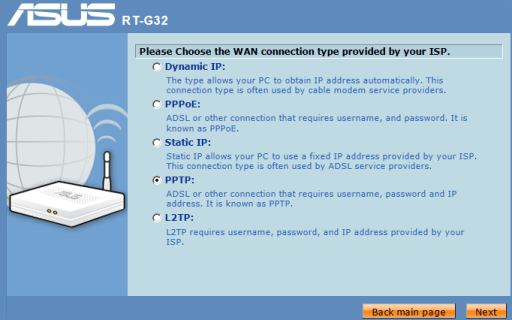 To access the router homepage, the user has to get to 192.168.1.1. Then account data is required – login and password (admin/admin). The device web-interface is available in twelve languages among which are Malaysian, Tai, and Turkish. 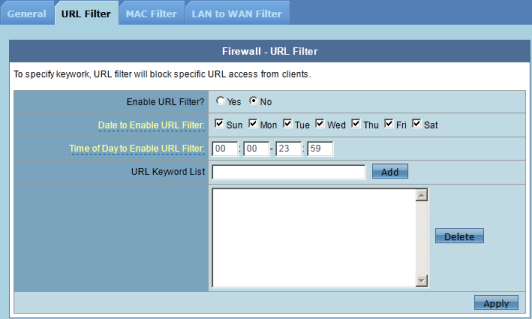 In the Network Map menu there’re three sections: Internet connection status, security and the list of clients. 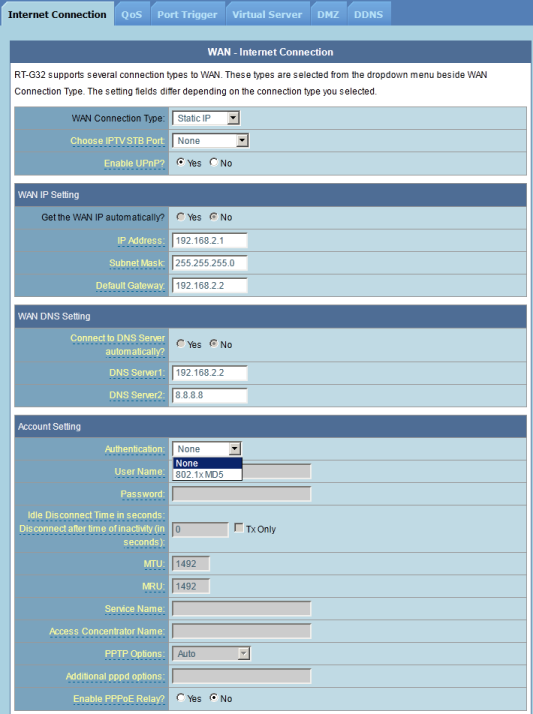 Let’s turn to the Quick Internet Setup tab that allows the user to easily configure the router main parameters for accessing the Global net. 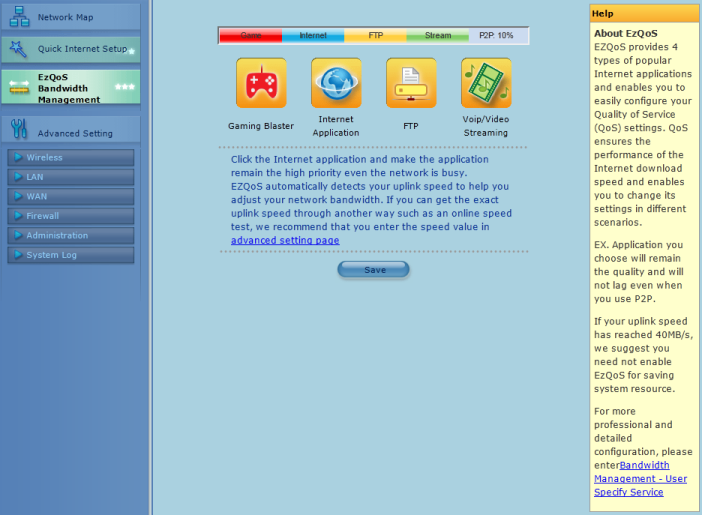 Also on the router homepage there’s an item EzQoS. The EzQoS program provides four types of popular internet-applications and makes quality of service (QoS) configuration quite simple. Now let’s study the Advanced Setting group of the main menu. 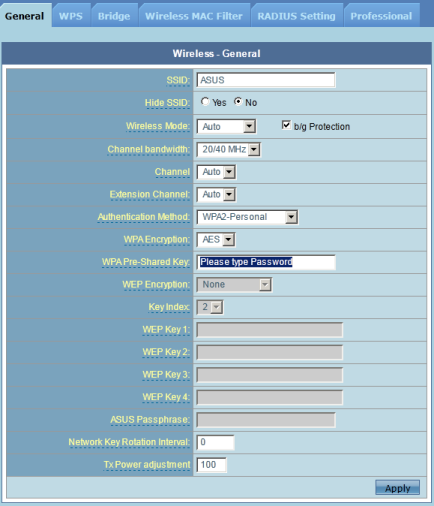 The Wireless group allows specifying the Wi-Fi module operation parameters. The General tab of this group contains the settings for the main network. 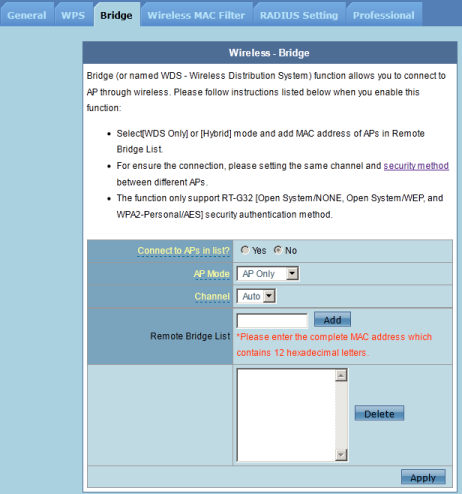 The Bridge tab allows one to activate the bridge function which lets you connect to other access points via a wireless net. 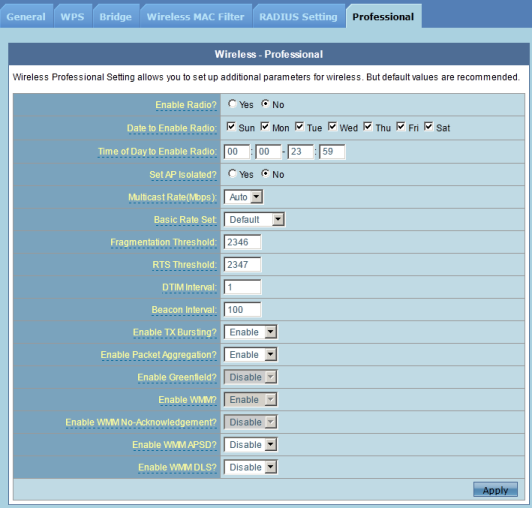 The Professional tab allows the user to configure advanced parameters of the wireless net. 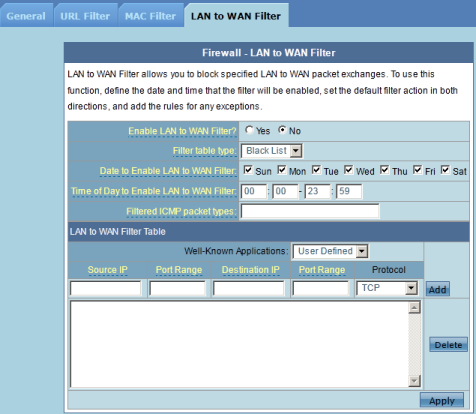 The next is the LAN group intended for configuring the IP-address of the LAN-port and the subnet mask, it also allows turning the DHCP-server on and setting routing rules. In the WAN group one can configure the Internet connection, manage the bandwidth and status display of the following: the virtual server, the port triggering, the demilitarized zone and the DDNS. 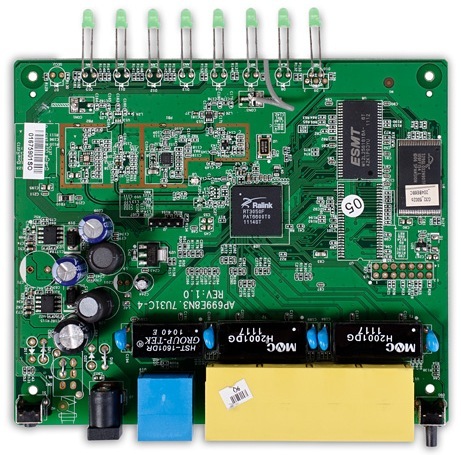 ASUS RT-N10 rev. 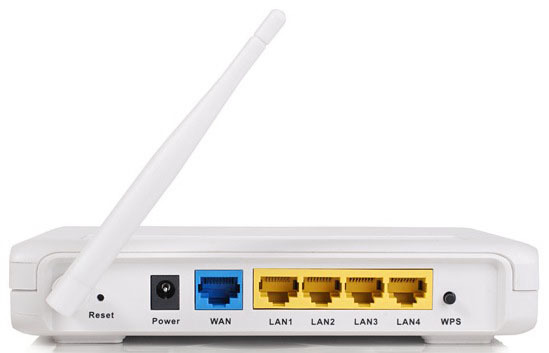 B1 and RT-G32 rev.C1 support the following internet connection types: static and dynamic IP, PPPoE, L2TP and PPTP. The 802.1X MD5 support was a nice surprise; it allows connecting even to those providers who demand this authentication method. 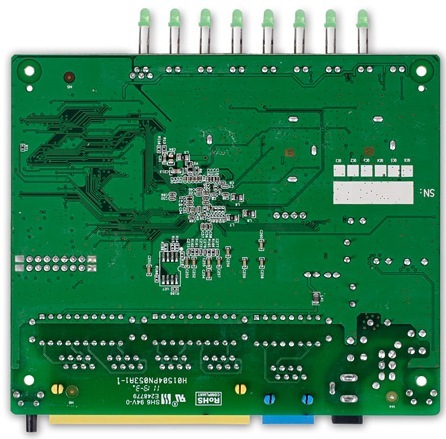 If the provider offers IPTV with the use of the corresponding set top box, then the IPTV STB port choice allows specifying the port to which this network equipment is connected. 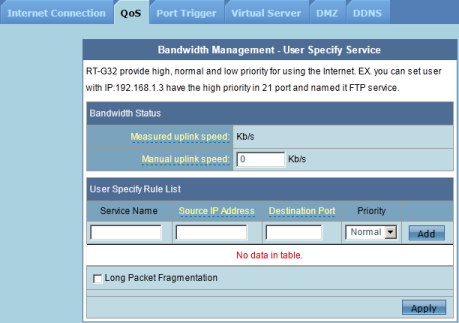 In WAN QoS tab one can manually set the speed of the existing connection if the router fails to detect it automatically. 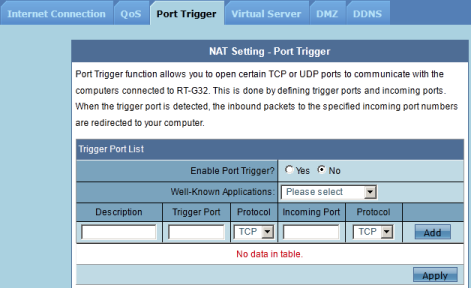 The Port Trigger tab allows redirecting TCP and UDP ports to communicate with computers connected to the router. 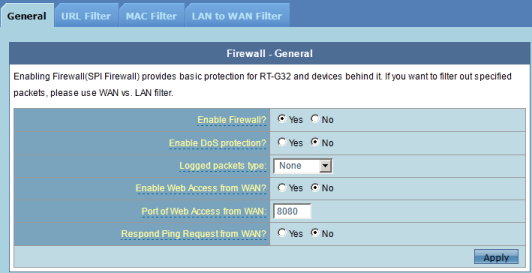 Turning Firewall on (SPI Firewall) provides RT-N10 rev.B1 and RT-G32 rev.C1 and devices behind them with basic protection. If necessary, certain packets can be filtered based on URL, MAC and IP-addresses, numbers of TCP/UDP ports. 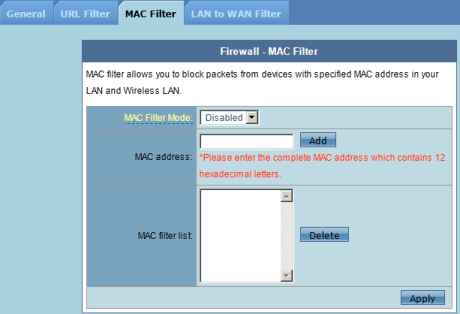 These settings are configured in the Firewall group. The general tab contains parameters which allow turning protection against DoS-attacks on, permit or deny external echo-requests. With the help of the Administration group the user can choose one of three operation modes. 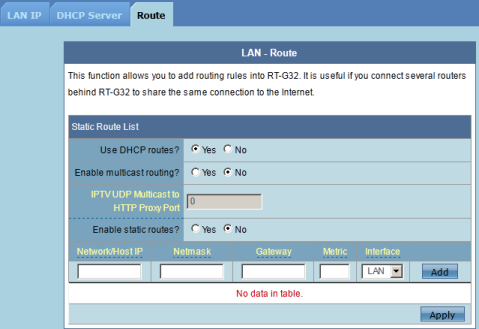 If “IP-sharing” is chosen the internet connection is performed via PPPoE, DHCP, PPTP, L2TP, static IP-address. Also, by default, in this mode NAT, Firewall and the DHCP-server are on. In the “Repeater” mode, the router increases the cover range of the existing wireless net. Also, there’s an “Access Point (AP)” mode when the device performs the functions of the same-name equipment. The System tab of the Administration menu allows changing the administrator’s password, specify the time zone, the NTP-server. 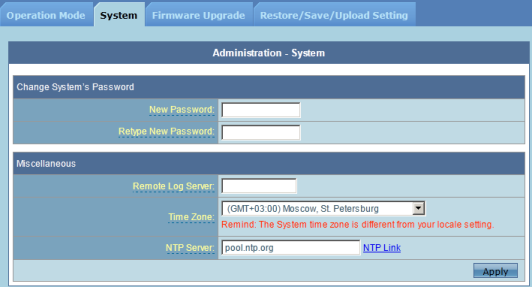 Unfortunately, the name of the NTP-server can’t have Cyrillic symbols in it. Also, the list of time-zones doesn’t reflect the changes in the Russian Federation law. Current settings can be restored or saved with the help of the Restore/Save/Upload Setting tab in the Administration group. The System Log group gives access to the log of the system and the wireless network and contains information about port forwarding and the routing table. Now let’s turn to the command line interface. The command line interface is the same for both models. To access the System Command page, one has to add the following to the IP-address in the URL bar of the browser: Main_AdmStatus_Content.asp. 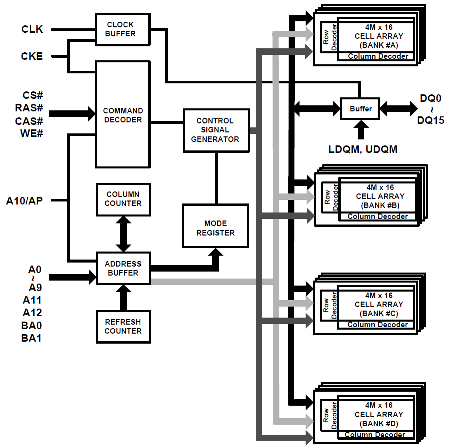 This page allows running the commands of the built-in operating system. The account data for accessing System Command are the same as for the web-interface. Besides this method, there’s a traditional way to access the command line – with the help of Telnet. Unfortunately, it’s impossible to disable this access. 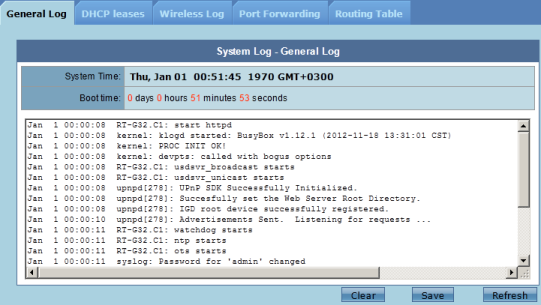 There’s a Busybox library version 1.12.1 installed on the router; to see the description and the list of supported commands, invoke busybox. With the help of the cat /proc/version command we get information about the built-in operating system. The list of supported encryption types and file systems is in the /proc/crypto and /proc/filesystems files. Let’s obtain information about the device CPU and memory from the /proc/cpuinfo and /proc/meminfo files. 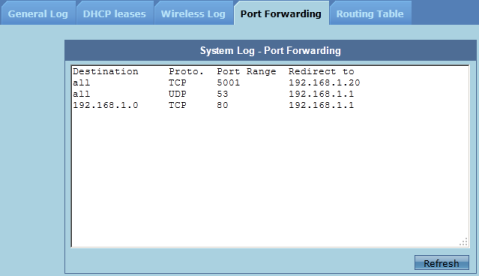 Now, with the help of the ps command let’s find out what processes are running on the router at the moment. With the help of the ls command let’s see what files are located in the /bin and /sbin, /usr/bin and /usr/sbin catalogues. Among the /usr/sbin files there’s the nvram utility. This command lets the user see and change the main parameters of the system operation. Now let’s test the devices. Traditionally, we start the testing section with determining the device booting time under which we mean the time interval between switching power on and receiving the first echo-reply via ICMP. 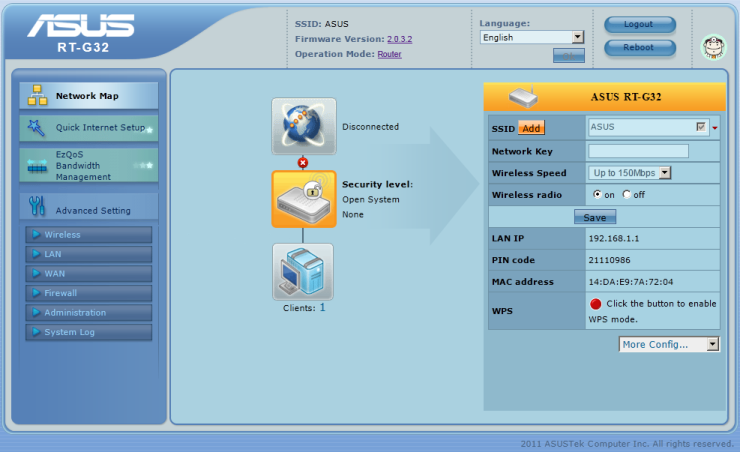 ASUS RT-G32 rev.C1 and RT-N10 rev.B1 wireless routers boot in 35 seconds. The next test is the device security against network attacks; for it we used a Positive Technologies XSpider 7.7 network security scanner (Demo build 3100). We scanned from the LAN-port. Altogether we discovered six open ports: TCP-23 (Telnet), UDP-53 (DNS), TCP-80 (HTTP), TCP-9998 (unavailable), TCP-18017 (HTTP) and TCP-49152 (HTTP). The most interesting information we discovered is presented below. We don’t consider the detected insecurities critical except for the probability of running a DoS-attack on the built-in DNS-server. We certainly tested the devices’ performance. For testing, we used the JPerf 2.0.2 utility. The main parameters of the testing stand are below. 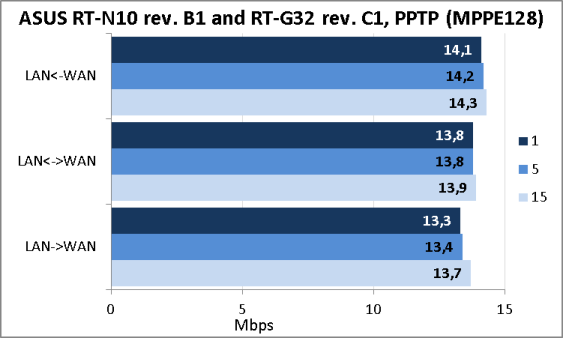 First, we measured the data transmission speed between the wired and wireless network segments for one, five and fifteen simultaneous TCP-connections. Then we measured transmission rates between the LAN and WAN segments with NAT being used. 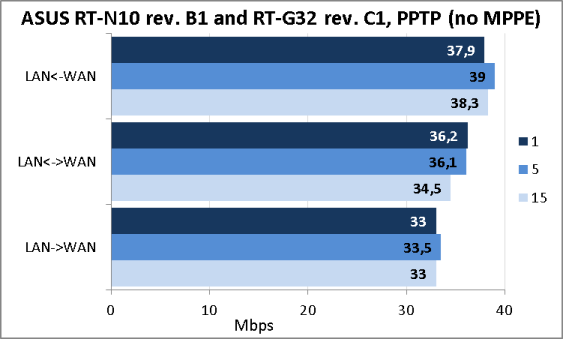 Also we measured user data transmission speed via PPTP with and without the use of MPPE. The obtained results are below. Here we’d like to finish the testing section and make conclusions. 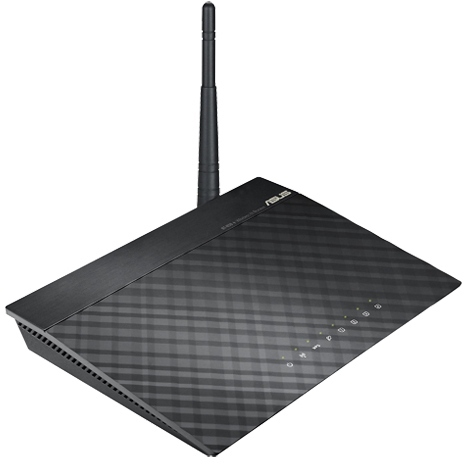 So far in our testing lab we have only tested upmarket or middle-market models of ASUS wireless routers. 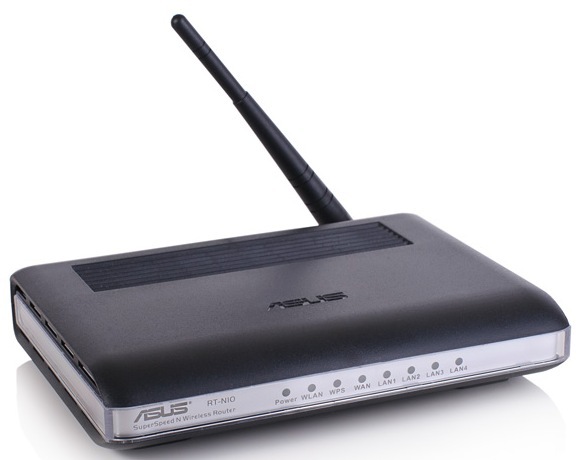 The current material fills the gap and presents to our readers a review of low-cost wireless routaers with Fast Ethernet ports - ASUS RT-N10 rev. B1 and ASUS RT-G32 rev. C1. They are the cheapest devices of this vendor we’ve ever seen. Naturally, we didn’t expect performance nywhere near that of upmarket products; however, the speeds we got were a nasty surprise. We think that ASUS RT-N10 rev. B1 and ASUS RT-G32 rev. C1 will suit only the most undemanding users or those whose budget is very limited. In all other cases we’d advise to turn to at least RT-N10U which we described in one of our reviews. The advantages of the tested devices are listed below. Unfortunately, we can’t but point out the disadvantages of the models at hand. 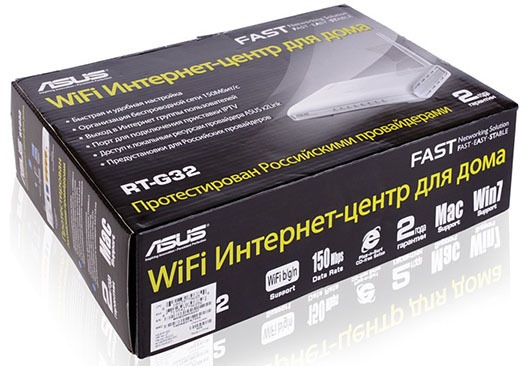 When the article was being written the average price for ASUS RT-G32 rev.C1 and RT-N10 rev.B1 in Moscow online shops was 1250 RUB.